I was little more than a child, and while most of my peers barely knew how to write a few sentences I already used to write fluently. It was a passion I was born with. Over time I wrote numerous articles and books. Some were stories, some other philosophical and social treatises. I felt delighted in front of the first blank page of a notebook and throwing down thoughts. A great pleasure. When I met the devotees, I thought that I had to give up something big to capture Krishna’s mercy and so deserve to have a life in Krishna consciousness. I had “stumbled” in the most meaningful life I could desire. I wondered what could be the thing to which I was more attached, the thing that could give me the feeling of having definitely cut the bridges with my past and that would help me not to retrace my steps. I concluded that the biggest thing would be to destroy all my writings, where I spent a good part of my youth. So I did. Dozens of thickely written notebooks went up in smoke. I accepted. Obeyed. I was convinced that so had to be a spiritualist. Not long after (in 1975) a letter from Srila Prabhupada arrived at the temple where he asked all the devotees who had an academic title or even a natural tendency to study to go to Vrindavana, because he had a plan to open a university there. Being at the time the secretary of the temple, I received the letter personally and read it before anyone else. I felt that was a call from my Spiritual Master and asked the permission to leave for Vrindavana. In particular, I wanted to study Sanskrit, which has always been my greatest wish. I wondered if it was right to interpret a direct instruction from the spiritual Master up to the point of getting to an opposite conclusion, but I said nothing and lowered my head again. In 1977 I lived for some time at the temple in London, that at that time was in Bury Place, very close to the British Museum. Wandering through the huge halls of that wonderful building, I encountered editions of the Ramayana and the Mahabharata and spent many hours of the day reading them. The temple president wasn’t happy with my service but I could not get away from those pages. A few days after Srila Prabhupada’s departure, I took the vow to write and publish the Ramayana and the Maha-bharata in Italian, which I did in 1987 and 1989. To date, I have written almost twenty books in Italian, Spanish and English and a large quantity of articles. However, the commitments of an administrative nature have always distracted me from the type of study necessary to write at a high level. For me writing is a lifestyle, I can’t write (certainly not with pleasure) in the spare time of an incompatible service. In the 90s I started writing the Vedanta Sutra in Italian and reached almost the half of it, about 500 pages. At that point I interrupted my work. The two reasons were that I wanted to write it in English and that I wanted to translate the sutras directly from sanskrit. So I started searching for a teacher, with no success over the years. I started several times but I always had to stop. I never found anyone with the passion or time necessary to follow me in this study, not even if I paid for. I made the last attempt in the year just passed (in 2018) in Vrindavana. I went to see a learned scholar asking him to help me study. His response was so tepid and detached that I preferred not to waste time re-starting again with the certainty of having to stop it again. Of course I already have a general understanding of sanskrit grammatical construction and I own several grammar books and dictionaries. Also on the Internet you can find several dictionaries online with which it’s faster to look for terms than on paper. Now I no longer feel completely abandoned to myself on sanskrit studies. In my life I have had various “administrative services”. Whether I liked it or not, in other word if I liked spending time and energy on these, is not important. Devotional service should not be done when you like it and if you like it. If necessary you have to do it. Now the circumstances came to a point where I have almost nothing left to do in that field and I am free. I have also entered my old age, when the body and the mind no longer react productively, and I can more peacefully study and write. These are the plans that will keep me busy for the next years. A vritti commentary on the full Maha-bharata. Not a summary like I did in the late 80s, but the complete edition, all the one hundred thousand verses. The first difference is that when I read something that does not convince me I go directly to the Sanskrit verse. Now I have two complete editions with the verses in sanskrit devanagari. Having almost finished the whole Adi Parva I can say that I have met several mistakes, committed because these translators and commentators are not members of the Vedic tradition, but scholars who do not accept the authority of the Vedas. They speak of myths, we speak of history. The Vaisnava approach is integral and gives greater guarantee of authenticity. The second difference that you will find in my edition of the Maha-bharata the presence of numerous footnotes that clarify historical and philosophical passages. In this way the reader is helped to understand something. The Mahabharata is often a complicated book and without explanation most readers feel lost and remain in the dark. To date I write this editorial, Adi Parva is at a good point. Up to now is over 500 pages in large format, two columns, with much more than 1,000 footnotes. In a few months, Adi Parva will be ready and published in both paper and electronic versions. To complete all 18 Parva of the Mahabharata should take me a couple of years. The second literary work is the Vedanta Sutra, with verses translated directly from sanskrit and with long explanations. I do not say much now about this project because I am in the process of resuming a work that began and was suspended many years ago. 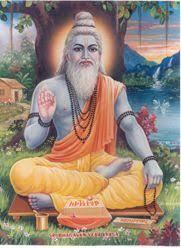 But it will be a real compendium of all major Vedic philosophies. After these I have the project of a complete edition of Valmiki’s Ramayana, complete with all 24,000 sloka and 7 Kandas. All this is enough to keep me busy for the next few years, but nothing prevents me from publishing question and answer books in Spanish and English. The relative ease of these texts is that they get build up by themselves as I answer the questions people ask or by transcription of my classes. The answers and lessons that you’ll find in the books will not be the same of the ones I originally gave, but they will be expanded and deepened. So far I am dedicating one hour a day to finish my second book in Spanish. It is my service to our Lords Radha and Krishna of Vrindavana and to my eternal Spiritual Master, to whom I owe everything, Srila Prabhupada. I hope that they and all the devotees are pleased with me. Subscribe to Isvara Archive. We need your help.